So far on my week-long journey into my favourite stationery, i've got excited over Anthropologie pencils and shared my discovery of Ribbon Squirrel's notebooks on Etsy. Day 3 is the turn of an item that i so desperately wanted as a child - years spent only being allowed to write in pencil and then the glorious day of being allowed to start using a Berol handwriting pen! I have a bit of a dilemma in that somehow i have never learnt the 'proper etiquette' of holding a pen and have found myself forever holding my pen in what i'll only describe as a claw position... Twenty or so years of 'the claw' is a very hard habit to break, so finding pens that i can hold comfortably for long periods of time is a bit of a nightmare. Smooth edges are a must, soft grip is preferred and i'm a bit of a magpie for metallics. 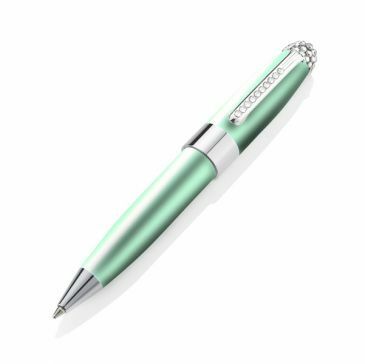 At the moment, the pen on my wishlist that seems to tick all the right boxes is the Duchess pen from Ice London. I've picked up some of their metallic pencils before and i love the colours - this light green version just makes me think of Spring!